Think your commute was bad? The worst I have heard of is one consisting of a 50-lane (that’s f-i-f-t-y lanes) highway, called the G4, which joins up Beijing, Macau and Hong Kong. 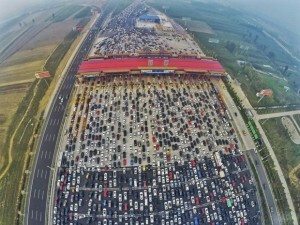 It has been referred to as “the Great Crawl of China”, and “a waiting area for toll booths”. There exists a checkpoint plaza along the way that narrows the 50-lane highway to 20 lanes, and this can typically tie up traffic for days. In 2010, motorists were stranded for 12 days trying to get to their destination. Pictures from here. There was another major tie-up back in October 2015 linked to a Chinese holiday, depicted below by a drone. Another picture taken of the now world-famous commute, with the toll plaza visible in the background. 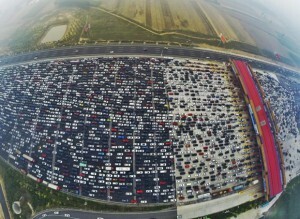 Photo taken on the same day, credited to REUTERS/China Daily.